Every Rolex watch dial tells you the obvious as well as some other not so obvious aspects of a Rolex watch. From the dial finish to what is literally written on the dial, the watch dial tells the story of the watch. Starting from the top of the dial, there is always the Rolex and the five pointed crown. The second line typically indicated “Oyster Perpetual” signifying that the watch is perpetually wound automatically utilizing an oscillating weight located inside the watch just behind the watch movement. A manual wound Rolex would only have “Oyster” on the dial. One of the reasons for an automatic watch was to insure that the crown was seated and sealed in order to keep the watch water and dust proof. With a sealed crown, there should be no reason to wind the watch if it is being worn daily. 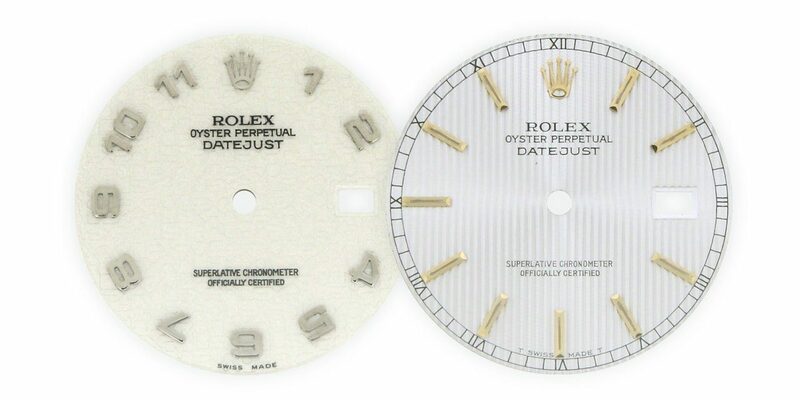 Many times, one will see “Oyster Perpetual Date” if the watch has an automatic date mechanism (that one is obvious). Below this line is either the hands, or the watch model. Depending on the watch, the model name is above the watch hands (eg. Explorer II) or the model name is below the hands (GMT’s). Either way, the dial should indicate the type of watch. For most older Rolexes, and for all newer model Rolexes, there is a designation for “Superlative Chronometer” on one line, and “Officially Certified” on the line below. Only watches that have been certified by COSC for accuracy tested with a standard deviation rate of -4 to +6 seconds within a 24 hours, tested over a ten day period can have a “Chronomoter” designation with “Officially Certified” on the dial. Many Swiss watches are COSC certified, but Rolex submits the most amount of watches for COSC certification in the world. Some older Rolex models such as the Submariner 14060 or Air King models were not Officially Certified until recently. Lastly, there is a difference between Swiss vs Swiss Made vs T Swiss which is explained here. There are other period differences with Rolex dials such as gloss vs matte dial finishes, plain painted dial dots versus white gold surrounds, but those are details for another article coming soon.